Ever heard of an MP3 Experiment? 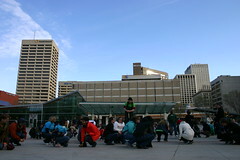 Think of it as a giant, updated version of the game "Simon Says" …all you need to participate is an MP3 player (iPod, etc.) and headphones. Here’s how it works: anyone visiting spreadthewords.ca can download an MP3 file onto their portable MP3 player. 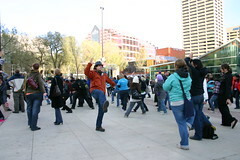 On the day of the experiment (without listening to the MP3 file ahead of time), participants gather at a prescribed public location and at a pre-determined time all push play. Hilarity ensues as participants carry out ridiculous, coordinated instructions delivered to their headphones via an omnipotent narrator and everyone else tries to figure out what the heck is going on. You can see more photos from the evening here. Stay tuned to epl.ca and @EPLdotCA for updates on the Spread the words campaign.